A special date arrived for me which comes the same time every year, to celebrate my husband’s birthday and every year me and my girls take him out and treat him to a lush dinner that ‘I’ haven’t had to cook or wash up! Normally we take him to somewhere familiar, somewhere where we go a lot and we know that the girls eat the food as we all know how kids can waste food. But this year we tried somewhere that we had only been to once before, and we went back because the last time we went we had a brilliant time. The restaurant is called ‘Harleywood Diner’ and is situated just off of the Eastbourne seafront down a rather glorious and multi-themed road. There is a couple of Fish and Chippy’s, Chinese restaurants, A Fruit and Veg shop – Which my nan has told me is the only place in Eastbourne to get her treasured Cob Nuts, A Hairdressers, Nick Knack shops, boutiques and so much more… But Harleywood Diner is American themed, which is what drew us there in the first place. I for one have always wanted to go to America but as of yet in my life the opportunity has not arisen for me to do so, so this was indeed the closest thing I could get to my American Dream. The neon signs are what the eyes see first, calling you in, and when the door opens you can feel your jaw drop at the sight. 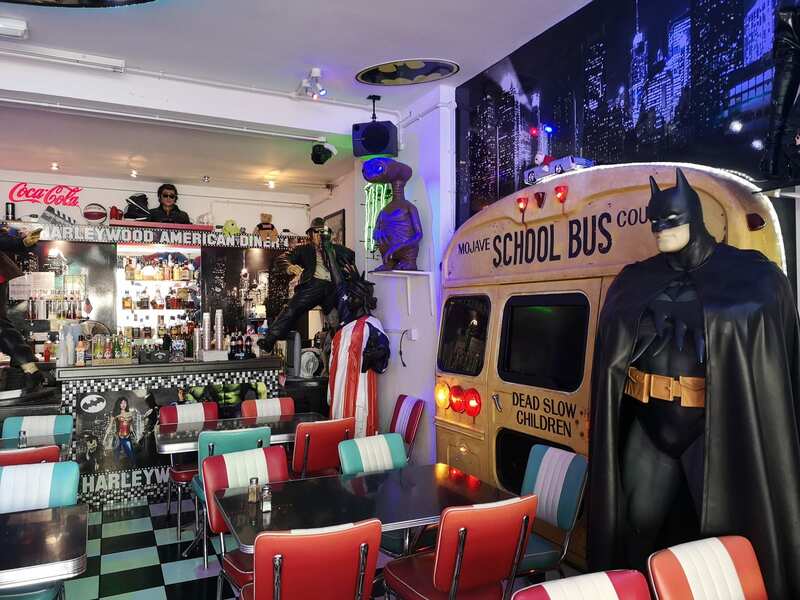 What greets you is a proper American themed diner with the plush plastic pvc leather type benches and chairs, black and white chequered flooring and BATMAN! 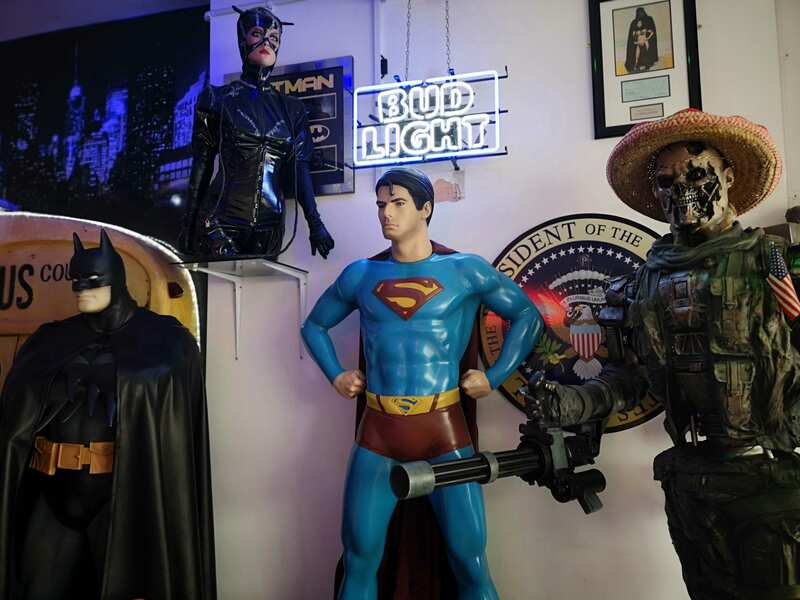 Yes, really, Batman is there. 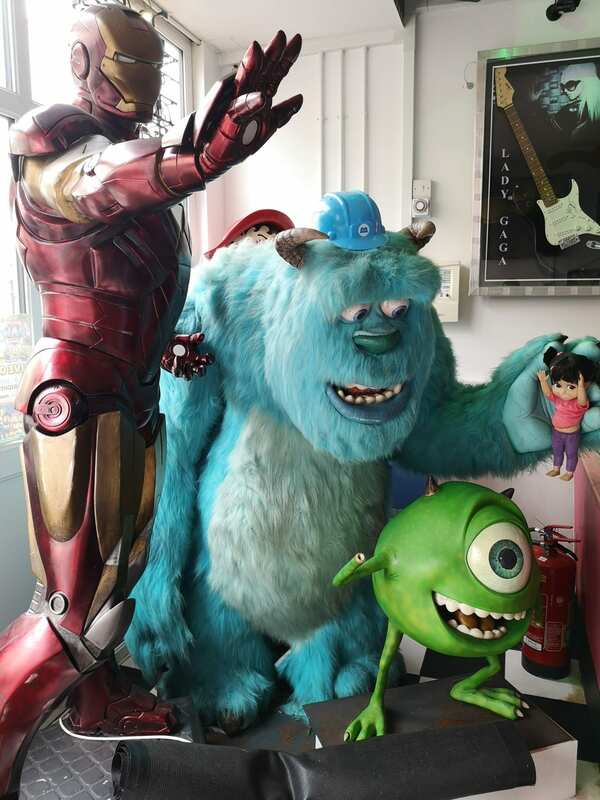 Along with Mike and Sully from Monsters Inc and little Boo, Superman, The Terminator, The Minions, The Simpsons and a cool back end of an American school bus. Along with the film memorabilia is pop memorabilia lining the walls too. A Guitar signed by Lady Gaga and pictures with Christina Aguilera, Mariah Carey, Jennifer Lopez, Cher and P.Diddy. 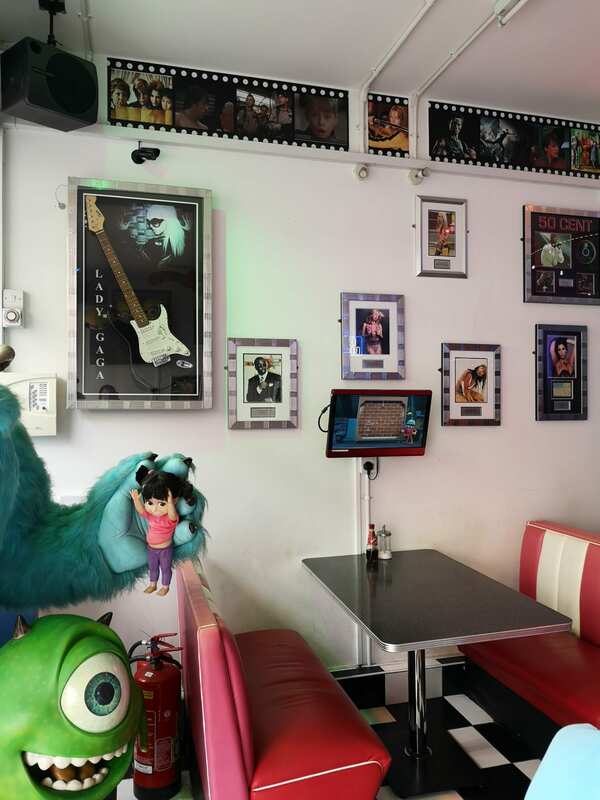 And even some television screens with the Monsters Inc movie playing to keep the kids entertained. Everywhere you look there is something to feast your eyes on! Now, lets get down to the business, Food Business. Looking through the menu there were many food options that made my stomach growl but that day I was in the mood for a chilli-con-Carne. 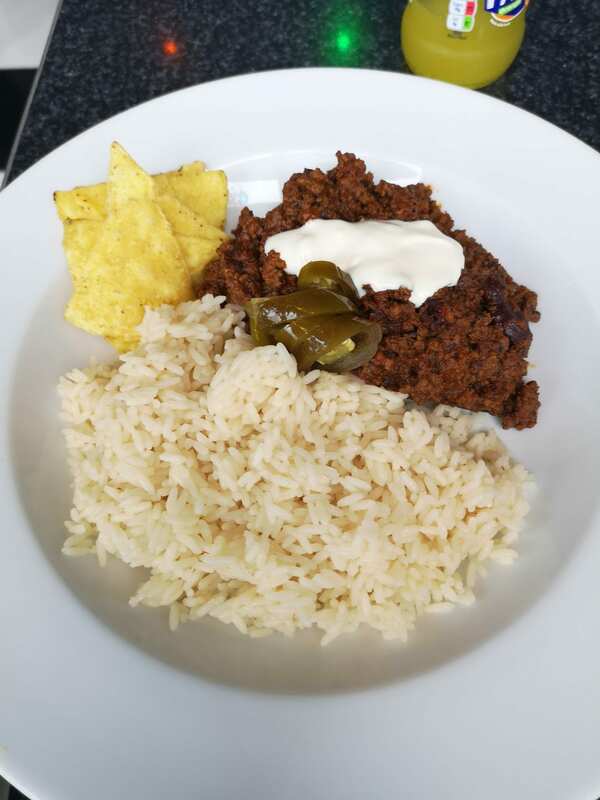 I love Chilli but I usually make it at home with vegetarian fake beef mince due to the fact that I cannot stand gristle bits that crunch under your tooth… But I was extremely and pleasantly surprised by the one I was served. It came with the minced beef in the sauce served with Jalapenos, a dollop of cream to cool your mouth down, rice and tortilla chips. The first bite soon had me devouring the whole dish, the reasons; the flavourings of course, plus I love a hot Jalapeno but also the whole lack of crunchy gristle bits. This meat dish for me was perfect, the meat so tenderly cook that it melted in my mouth and it was not in the slightest bit greasy, it was…Yum! 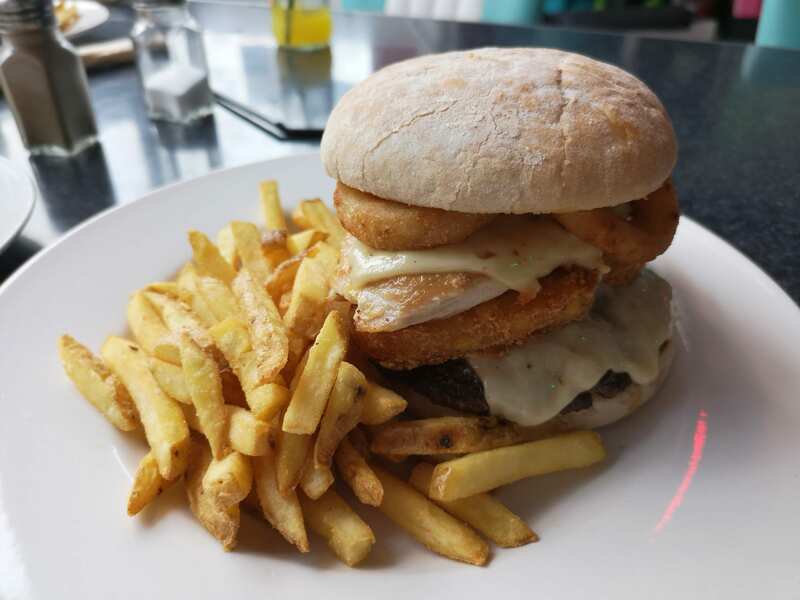 My husband Aka the Birthday Boy chose a HUGE burger which housed a beef patty with onion rings, three types of cheese, a hash brown, chicken, the bun and finished with barbeque sauce and chips. Now, my hubby can normally eat me under the table when it comes to food, but this day, I won. The burger was so huge he couldn’t manage all the chips as well, but he told me the burger was the best he had ever eaten, the meat juices, cheese and flavours filling his tummy so he couldn’t not even fit in pudding. So that for the Prunty family was another win. 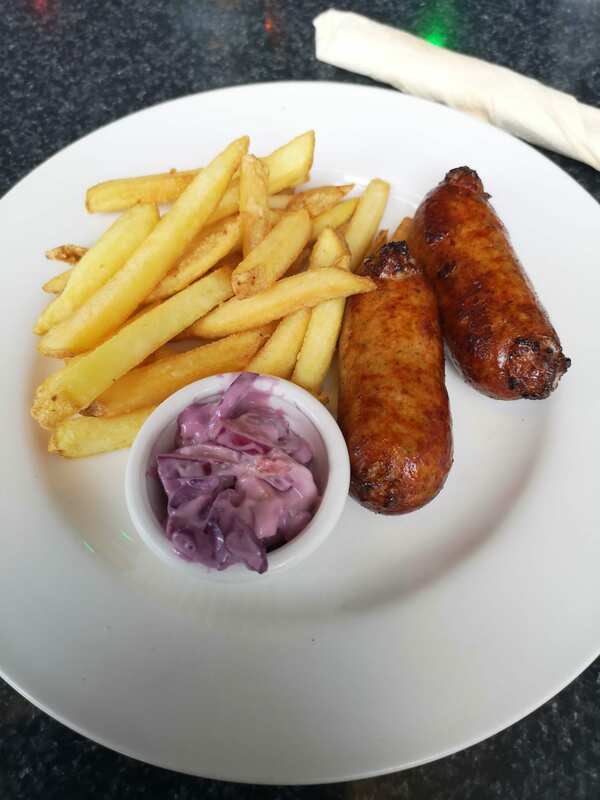 Lastly came the kids, my youngest went for the kid’s sausage meal which came with sausages, chips and homemade slaw. 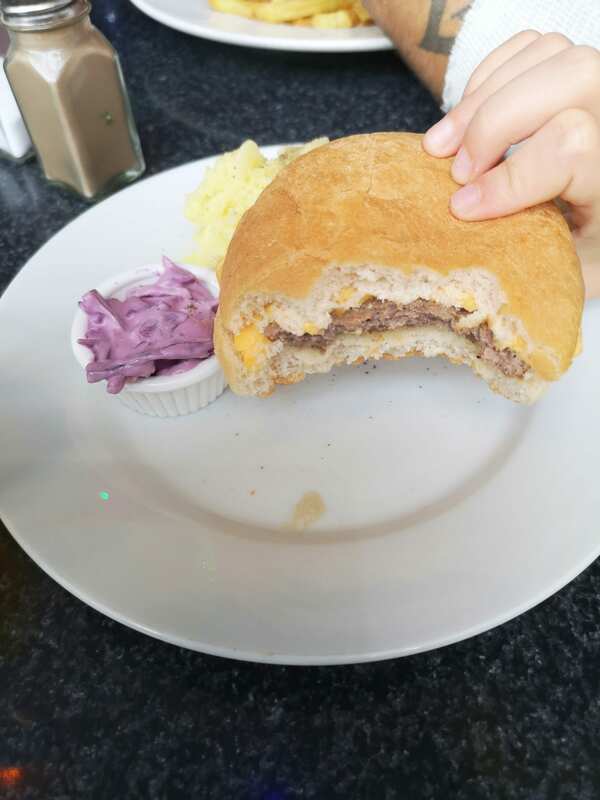 My eldest had a burger, mash and homemade slaw. The burger didn’t last long at all, so much so that she had already eaten half by the time my camera came out for taking photos and had devoured the whole thing within minutes which for her is a huge deal as she normally doesn’t eat a whole dinner… Ever! 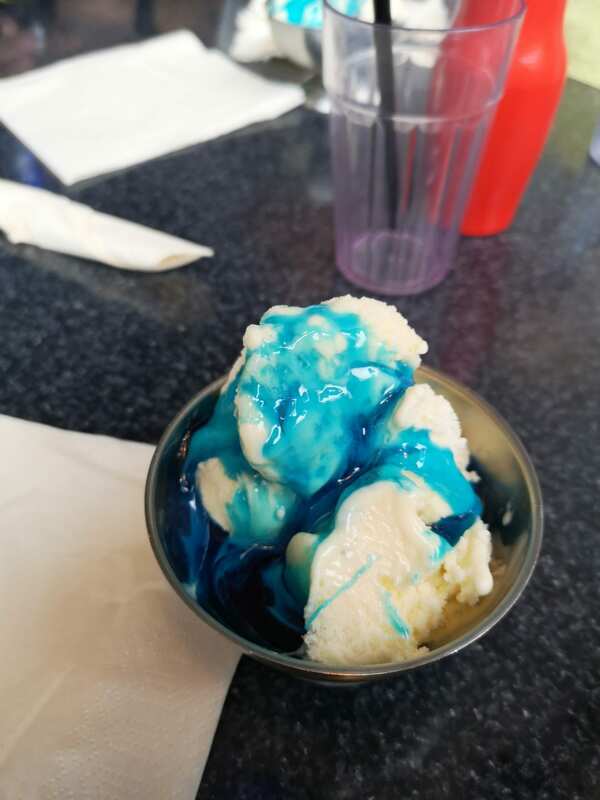 My youngest too ate all of the sausages and chips as she is a growing girl and both of them even saved room for some glorious ice cream with bubble-gum sauce. For us Harleywood Diner is set to become our new haunt, the food is just too good to miss. And I also have to give a shout out to the guy and chef who were the only two members of staff on the day we went along and made our visit well worth it. 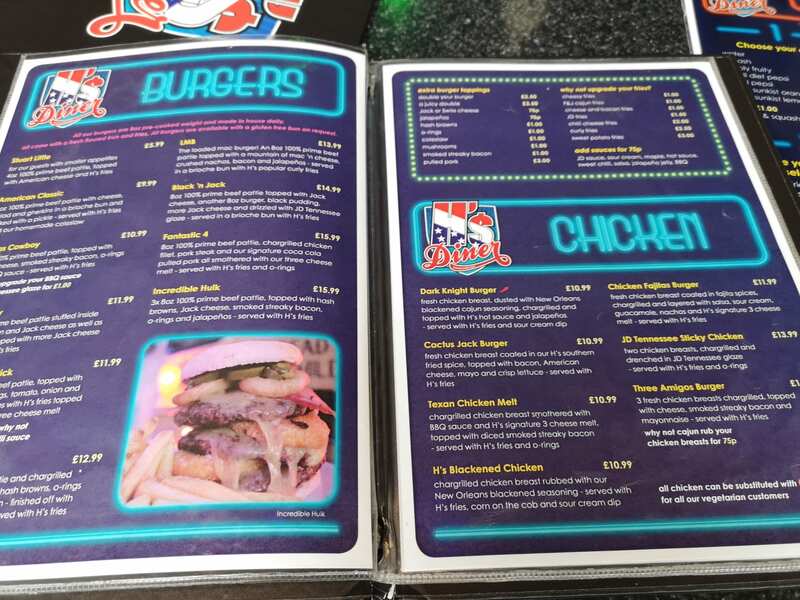 So, if you fancy a burger the size of a house, or a freakshake the size of the monster in the window then you need to go there! 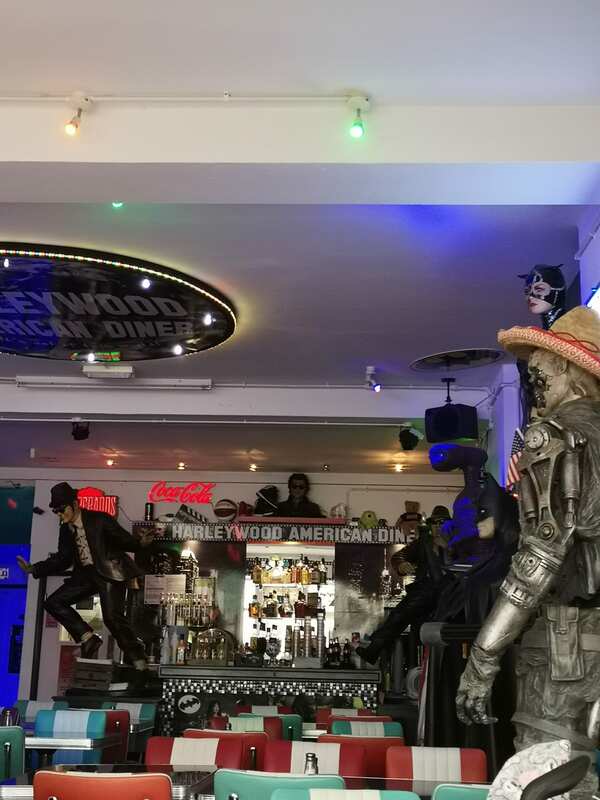 #American Diner, #Chilli, #Harleywood Diner, #Lady Gaga, #Mercedes Prunt, Burger, Eastbourne, Food, Sausages, Seaside.